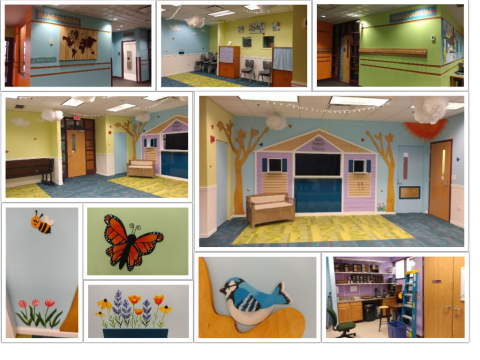 The Elmwood Park Public Library is proud to announce the renovation of our former story room and its premiere as the Imaginarium. This little room in the Kids & Teen Services Department has served our patrons well over the past 17 years, but was due for some much needed love. The room was renovated with funds from the Library's Board of Trustees, The Friends of the Elmwood Park Public Library, The Montclare-Elmwood Park Kiwanis, 15 individual staff members and contributions to the Library's gift fund. Now, we are proud to present a room that touts an amazing custom built puppet stage, as well as redesigned spaces, storage and furniture allowing the room to be used to host many different types of programs as well as a dedicated staff workspace. The room was designed and fabricated with the help of Product Architechture + Design, and Knudsen Construction Inc. Within the room, you will see hand-fabricated and painted pieces such as flowers, bees, butterflies, clouds and a sun. These pieces were done by our in-house artist and modeled after flowers and animals that are native to our region. If you are in the Chicago area, we invite you to stop by and see our work of art for yourself. Great work. It is very inviting!